One of the alternative teachings we espouse is the Holy Supper instead of the Sacrifice….The altar is not a place of human sacrifice, thank you very much. Blood atonement is NOT one of our doctrines. Yes, Yeshua gave his life rather than resist arrest and risk his family and students’ persecution and deaths, but he did not give it as a human sacrifice to a blood-desiring Heavenly Father bent on some kind of weird “divine justice” or “payment” for everyone’s sins. Yes, that is a confusing statement when contained in such a small package. And it comes across as even somewhat polemic. I’m not surprised that it prompts a follow-up. Let’s see if I can unpack that a bit…. To begin with, the concept of original sin and the required death of God’s Son to “pay” for these sins is a strongly dualistic belief. My understanding is this is one of the holdovers we inherited from the early Christian Gnostic movement (and/or we may inherent this strong dualism from Zoroastrianism). So too with the self-abasement and whipping the hide off one’s back, for that matter. In what we now call the ancient Gnostic movement self-hate is normal. Everything of the earth is evil. We are supposed to be spirits, but we have been trapped here on earth. Trapped by an evil god, in fact (often depicted as the G-d of the Hebrew bible – speak of being polemic!). Therefore, anything and everything which has to do with the earth is corrupt and evil. This is the background which sets up viewing the Garden of Eden story as resulting in Original Sin, from what became the orthodox Christian perspective, at least. But I feel this is a mistake. When reading a text I think it is important to at least consider the perspective of those who wrote it. In this case we turn to the early Hebrew people, and ask what might they have thought of this story? We cannot be certain of course. But we can ask modern Jews how they interpret the story of creation and the “fall” of man. The short answer to this is that the world is a good thing. It is a positive creation. As are we. The earth and everything in it has been created by G-d and is fundamentally good. (The opposite of the ancient Gnostic position that everything is evil.) Furthermore, most modern Jews, and presumably their Hebrew ancestors, do not see any “Original Sin” taking place in this story. And it is a story in the Hebrew bible -not the Christian New Testament- so I give their interpretation a lot of weight. They say what took place was a mistake. A “missing of the mark” (the meaning of the word from which “sin” is translated). An error. But nothing like the majority Christian understanding of original sin, which is much closer to the ancient Gnostic understanding; this is *not* the Jewish understanding. Therefore the entire foundation of the idea that God killed his Son to erase our original sin is a mistaken belief. At least if one sides with the Jewish perspective of their Hebrew bible. And, as I said, I am among those who do. So if you look at the story of the crucifixion through this lens, instead of the lens of Original Sin, the meaning behind the statements may begin to make more sense. Bearing in mind that I cannot speak for the bishops of the EEC because I may misrepresent their intended position, I will only speak of my own understanding of this position. My impression of the reason the EEC differentiates between a Holy Supper and a Holy Sacrifice, is that we prefer to celebrate the ideals of peace and love and the search for transcendent understanding (the way we interpret the term “Gnostic” — the search for spiritual apprehension of the Divine; and very much *NOT* an understanding that the world and G-d are evil). We do *not* celebrate the murder of Jesus. We do *not* believe he had to be slaughtered as a replacement for Temple sacrifice. This will be one of the major differences between the orthodox Roman Catholic Church’s view of Original Sin and the way the church I am a member of looks at it. And a pretty fundamental difference at that! One might even observe, this is why I feel it is so important to examine one’s cornerstone beliefs. And the meaning of “Original Sin” is one such example. If you get that wrong, then a bunch of other understandings are going to be misguided. This is what I think has happened in many Christian churches. Question #2: The post “Particulars of the Ekklesia Epignostika Church” stated that your church believed “in Jesus his Son who came and brought the world salvation!” What kind of salvation was this? This is a great question. I cannot say I have a 100% understanding on this point. Coming to an understanding of this question is at the core of my entire spiritual search! But I will share my thoughts, such as they are. As for the church bishops, they’d have to speak to their views. I suspect it is close to the Liberal Catholic Church’s view in that they leave this interpretation up to the individual. And off hand I cannot recall their individual opinions on this point. Speaking for myself, if the historical scholars are right, and if the apocalyptic teachings of Jesus are accurate (that’s a touchy problem, given the various revisions of biblical text over the centuries, we cannot really be certain of most of Jesus’ sayings are in fact his), then I have a problem because I do not subscribe to apocalyptic teachings. I believe these are best understood in their own historical narrative, not ours some 2,000 years later. So all the groups that point to Revelation as a foretelling of things to come, and the end of the world, I just can’t buy into that. And all that had been commanded them they told briefly to those around Peter. And afterwards Jesus himself sent out through them, from east to west, the sacred and imperishable proclamation of eternal salvation. 9 Now after he rose early on the first day of the week, he appeared first to Mary Magdalene, from whom he had cast out seven demons. 10 She went out and told those who had been with him, while they were mourning and weeping. 11 But when they heard that he was alive and had been seen by her, they would not believe it. 19 So then the Lord Jesus, after he had spoken to them, was taken up into heaven and sat down at the right hand of God. 20 And they went out and proclaimed the good news everywhere, while the Lord worked with them and confirmed the message by the signs that accompanied it. Mark 16:8 Some of the most ancient authorities bring the book to a close at the end of verse 8. One authority concludes the book with the shorter ending; others include the shorter ending and then continue with verses 9–20. In most authorities verses 9–20 follow immediately after verse 8, though in some of these authorities the passage is marked as being doubtful. In line with this questioning search for Jesus’ nature, there is what has been called the “Messianic Secret.” Jesus kept telling people *not* to proclaim who he was. Was this because he knew no one tells things faster than what they have been told not to tell? Or might it be because he knew that people expected a warring messiah? And he did *not* wish to start a revolt. Therefore, he told people not to speak of him so they would be safe. The Romans killed rebels. Ultimately, this is why the Romans killed Jesus (*not* the Jews – the Romans). And this ties in with the theme of Jesus turning himself in quietly so as not to get his friends and family murdered alongside himself, and is why the EEC honours this form of Jesus’ sacrifice through the aforementioned Holy Supper. This is an *alternate* understanding -which I favour- to Jesus turning himself in so that he could be slaughtered on our behalf; as a substitute to ritual Temple sacrifice; as a blood sacrifice to G-d. As I indicated above, I just don’t believe that G-d has to murder himself to save us from original sin (which didn’t happen in the first place). My own view of what kind of salvation Jesus offers us is much more mystical. This is always hard to pin down in words. Or is for me at any rate. I personally think Jesus was speaking of breathing life into the Divine spark we each have within us. One of the sayings which I take to heart is found in the Gospel of John (which is an admittedly poetic Gospel and is meant to be taken allegorically) where Jesus says he is in the Father, and the Father is in him. He then says he is in us/we in him. Could he be clearer? (Apparently so! heheh.) To me this says Jesus found a unity with the Divine, and that we too are part of that Unity. John 14:20 NRSV: On that day you will know that I am in my Father, and you in me, and I in you. So I subscribe to an understanding closer to that offered by the Eastern Orthodox Church’s belief in theosis. This belief is still a vibrant aspect of Eastern Orthodox Christianity, it is just not a form of Christianity we are greatly exposed to in the West. And certainly it is greatly removed from Protestantism as a whole, because it tends toward a mystic interpretation (as does the Eastern Orthodox as a whole), whereas Protestantism is founded upon more literal interpretations of the written texts of the Hebrew and Christian bibles. James (Ch. 2): 14 What good is it, my brothers and sisters, if you say you have faith but do not have works? Can faith save you? 15 If a brother or sister is naked and lacks daily food, 16 and one of you says to them, “Go in peace; keep warm and eat your fill,” and yet you do not supply their bodily needs, what is the good of that? 17 So faith by itself, if it has no works, is dead. So for me, the salvation Jesus brought us is found in his example and his loving encouragement that we too find a way to allow that Divine Breath of Life to live though us, and to become vehicles for that in-dwelling Spirit (Shakinah/Holy Ghost) to live in/through/with us. 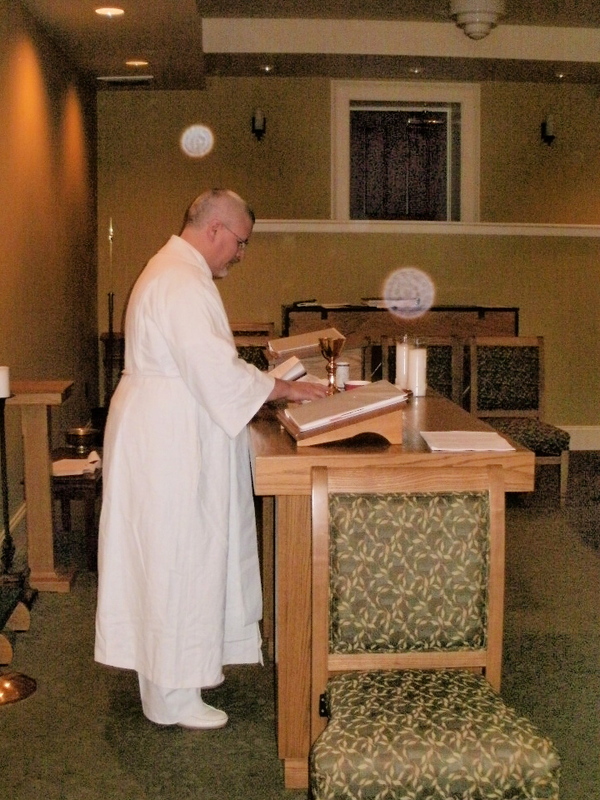 And one aspect of doing this may be experienced through participating in the Eucharist celebration. I really do believe/feel that is one way to bring us into contact with something Divine. I like to think this results in the Holy Spirit becoming more active in our life, and body, and I hope our soul and spirit. This is quite clearly another point where my belief is quite different than that of the Roman Catholic Church. And it is one of many reasons I personally could never be a RCC priest (nor would they have me! it is fair to observe). I have never felt that the ideas of original sin, and the blood sacrifice of Jesus made any sense. Why would God Almighty set up the world that way? It makes more sense to me that we are in a fundamentally good creation, are part of this good creation, and that we are here to learn to grow into beings becoming more resonate with the Divine. I don’t see salvation as something Jesus does “to” us. And it is something more than a philosophical view with which we agree/”believe.” It is our responsibility to follow Jesus’ example, finding a means of letting more and more of the Divine Spirit of the Christ to live in us each day. And there are many ways of doing this. Some days being “closer to the mark” than others. Why would one wish to become a priest? For me there are at least two good answers to this question. One is very personal and is about one’s private journey in search for the Divine. Part of me is trying to understand how one “finds God.” For me this is much less about the “outer trappings” of religion. Facing East, bowing to the cross, or in which sacred texts I turn for inspiration. It is much more about what is going on inside. It is less about what is in my head and much more about what is in my heart. And for me, for one who is so much “in my head” this is very difficult! Remembering that image of the glass globe, I am much more interested in learning to turn inward when seeking the Divine. In this sense, this is all about me and my spiritual growth and maturity. But there is another aspect, and that is of service to others. In this regard I view my role as that of a spiritual guide. In this role I see myself more as a chaplain. I am not here to tell someone else how to find God. I am here to help them increase their own understanding of how to encounter God. There is a great difference between these! Yet I have no idea where this may lead. This is a point I have left to “faith” in the belief that I will somehow end up benefiting others. Stated poetically, one might say I hope the in-dwelling Spirit of Christ might kindle the spark of the Divine in others. And I hope it does for me as well. Note that I did not list vocation or employment in my reasons for becoming a priest. The church I have chosen is tiny. They offer no paid positions – zero! I do hope that someday I might be able to use my training to secure a job more in line with my spiritual goals (my “thinking” mind says hospice care). But I have no idea if this will ever reward me financially. In terms of an investment in the physical world of Malkuth (a Jewish mystical term for life here on earth), this may be a net loss. Then again, those who seek their riches solely in this world may find they are impoverished in the next. So maybe this is not all that important. One must strive to maintain a sense of perspective (as hard as that is while paying a mortgage and light bill! hehehe). This is one of my dearest apprehensions, which I really try to bring home in my religious/spiritual conversations: God is ultimately ineffable. Which we forget at our peril. Or more practically, at the peril of others! Because as soon as we forget this, we find it much easier to harm someone for holding the “wrong” belief about (the ineffable!) God. Such behaviour simply strikes me as an oxymoron. Anything we can say about God limits and defines that which has no limits and that which cannot be defined. I Am That I Am-I Shall Be That Which I Shall Be. (In the original Hebrew, the phrase carries both meanings at the same time.) Seeing that rolling within itself, turning one inside out to the other, simultaneously and always in both-neither state, is as good a description of God as any. And if we truly understand this concept we will easily tolerate the understanding of others. We may not like it, but we will tolerate it. God only knows, they may be closer to an important Truth than are we. I believe we must allow for that possibility. And to the degree we do so, we are better prepared to later accept the differences of others, and perhaps some distant day discover we even appreciate some of their differences. And if we concentrate on this in place of hurting those who believe differently than ourselves, I believe we are working to bring about a better world in which all may live. I may be mistaken, but I believe it has to be easier to find God in a peaceful world than one embroiled in war. I may be naive -I often have been in the past- but I think this is a standard by which it is worth guiding our own course. So this is why I try to remain open-minded. Why I try to learn about other religious expressions, with the hope that I may be able to help someone else grow in their understanding of God/Divine, as I feel I have been doing. And I find this a beautiful and inspirational belief! At long last we introduce my church, heheh! The Ekklesia Epignostika Church (EEC) is the church I have chosen to join, be baptised into, and for which I serve as a priest. The EEC is of the Old Catholic Church (OCC) tradition. After many years of doctrinal disagreement, the Roman Catholic Church (RCC) and the OCC split in the mid-1800’s. The issue they were unable to resolve and most responsible for their schism was that of papal infallability. Both the RCC and OCC trace their roots back some 2,000-years to the same ancient source: The Apostle St. Peter (c. 32-67). Apostolic Succession is the transmission of the spiritual gifts entrusted by Jesus the Christ to his original students (later called apostles) by the laying on of hands. These spiritual gifts have since been passed on throughout history by the act of consecration, the direct laying-on-of-hands, in an unbroken line from the apostles to their successors, bishop to bishop down to the present day. Bishops are said to hold the “fullness” of these gifts. They share their commission in the name of the Christ with priests in their charge for the purpose of serving the community of the faithful and making the sacraments more readily available to the people of GOD Most High. These spiritual gifts insure and preserve the sacred life of the various branches of the One, Holy, Catholic, Apostolic Church’s sacramental nature. The word Catholic means “universal” and is an adjective meaning our church is universal. The use of the word “catholic” in the phrase One Holy Catholic Apostolic Church, does not refer to the Roman Catholic Church, but to the one larger “church” that is universal and apostolic. These are the outer expressions of one’s religious practice, which includes the form of worship, and the interpretation of scripture, doctrine and dogma. In a business-sense it also includes the organization and management of “institutional” churches. (Which have gotten a bad name in some circles, but really, serve a valid service.) The external practices of one’s religion would certainly include how one interacts with others within (and without) the religious community. It includes education, ordination, and the sociological aspects of the church. There is a cross-over or grey-area in the transition between exoteric and esoteric (outer/inner) expression of religious and spiritual beliefs and practices. But one way to discern the differences between these is to imagine one’s “religion” as a glass sphere. We are each facets on the surface of this globe. But where do we turn to find God? The exoteric looks sideways and outward/up to find God. The esoteric also looks sideways (this is the grey area each perspective shares) but is more intent upon gazing inward, toward the center, seeking common-union with the Divine. The EEC very much acknowledges this inward-turning as a useful and valid expression of Christianity. In this sense it embraces the “mystery” of our religion. And in turning inward, seeking the Divine Center, we believe we all move closer to one another. Seeking inward, we seek community not only with other Christian religions but non-Christian religions/spiritual observances as well. And this is certainly an important aspect of my understanding of becoming more Christ-like. Early Christians used the Greek word μυστήριον (mysterion) to describe the Christian Mystery. The Old Testament versions use the word mysterion as an equivalent to the Hebrew sôd, “secret” (Proverbs 20:19). In the New Testament the word mystery is applied ordinarily to the sublime revelation of the Gospel (Matthew 13:11; Colossians 2:2; 1 Timothy 3:9; 1 Corinthians 15:51), and to the Incarnation and life of the Saviour and his manifestation by the preaching of the Apostles (Romans 16:25; Ephesians 3:4; 6:19; Colossians 1:26; 4:3). Theologians give the name mystery to revealed truths that surpass the powers of natural reason, so, in a narrow sense, the Mystery is a truth that transcends the created intellect. The impossibility of obtaining a rational comprehension of the Mystery leads to an inner or hidden way of comprehension of the Christian Mystery that is indicated by the term esoteric in Esoteric Christianity. Even though revealed and believed, the Mystery remains nevertheless obscure and veiled during the mortal life, if the deciphering of the mysteries, made possible by esotericism, does not intervene. This esoteric knowledge would allow a deep comprehension of the Christian mysteries that otherwise would remain obscure. I think that pretty well sums up the “Mystery” aspect of Esoteric Christianity. Although, if one is interested in learning more, among the best books to read is “Inner Christianity” by Smoley. I found it very informative. It was one of the first books which I read that allowed me to think perhaps there was a place for me in the Christian church. We teach a sacramental semi-gnostic alternative-Christian approach. It is very important to understand that Candidates who become Seminarians with us will need to be able to work well with what the mainstream Church calls “heretical” and “heresy”. We are actually only semi-gnostic here, but many critics and mainstream Christians consider all gnosticism to be radical and heretical. We actually go beyond gnosticism, delving into deep inner Christianity in the esoteric tradition. Gnosticism and gnostics can sometimes be overly intellectual (understatement!) and get hung up on the letter of the law at the expense of the spirit. Theological debates and attitudes of “I know more than you,” are not part of our training or ministry to the public. One of the alternative teachings we espouse is the Holy Supper instead of the Sacrifice. We view the altar as the Communion Table, the Holy Table where Yeshua shared a ceremonial, esoteric, and literal meal with his students and family. The altar is not a place of human sacrifice, thank you very much. Blood atonement is NOT one of our doctrines. Yes, Yeshua gave his life rather than resist arrest and risk his family and students’ persecution and deaths, but he did not give it as a human sacrifice to a blood-desiring Heavenly Father bent on some kind of weird “divine justice” or “payment” for everyone’s sins. We actually prefer our priestly candidates to be married, instead of single, but it is not a requirement. We always ask our married applicants to be sure your spouse is one hundred percent behind you in your pursuit of Holy Orders. Our experience has told us that anyone whose spouse isn’t behind them will eventually fail to obtain Holy Orders. We encourage spouses to get involved and become ordained as a Deacon. The Ekklesia Epignostika is a family oriented church, and our Eucharist celebrations (“Mass”) are organic natural “rituals” very much like the primitive Christians in the first Century A.D. might have celebrated in their house-churches. Gnosticism is a positive path, a path of Light, illumination – not self-loathing and world-hating as some critics claim. Walking the Way of Gnosis, or Epignosis in our tradition, is not for the faint-hearted. Keep in mind we believe in an all-good and loving Heavenly Father, the True God, God Most High, and in Jesus his Son who came and brought the world salvation! We also believe in Sophia, the Heavenly (and Earthly) Mother. There is much value in extra-canonical literature and Gnostic scriptures, especially the Gospel of Thomas and Gospel of Philip. As for Gnostic writings, we use only the earliest Gnostic Christian scriptures and writings, not the later Gnostic writings, many of which Bishop Katia’s mentor and consecrating Bishop +Christian says are actually “psychotic.” Some of the later so-called gnostic writings make gnosticism seem loopy or downright dangerous. This is why we call ourselves semi-Gnostic and all-the-way Esoteric, Sacramental and Alternative. We adhere only to the primitive early Gnostic Christian teachings – of light and the Light of the World, Jesus the Christ and his “mother” Sophia. I thought I’d take a breath in my 12,000+ word “answer” (beginning with “On Becoming An Old Catholic Priest”) to share my impressions of the Eucharist (aka Holy Communion – the Blood and Body of Christ). I share the Old Catholic Church position (as well as Methodist and others) that the Eucharist offering of wine and bread is *not* *literally* transubstantiated into the literal blood and flesh of Christ. The wine has never tasted like salty blood to me. And the bread remains bread. I’ve eaten a lot of meat in my day, and the bread does not become meat. But that is a very limited earthly interpretation, and NOT what I think is important. A far better question is what may be happening in the spiritual realm, and in what way might Spirit be interacting with our physical realm? Herein is where I believe we may apprehend what it truly important! For those who may not know, when celebrating the Eucharist, the priest will bless the wine and bread, and in so doing act as a conduit for the spiritual energy of the Divine to flow into the wine and bread. It is this in-flowing of Spirit which “transubstantiates” the wine and bread. Not in the physical realm of the profane, but in the spiritual realm of the sacred. One way I’ve heard this described is to imagine that each and every molecule and atom in the physical universe has a spiritual counterpart. As the Spirit flows in-and-through the wine and bread (our symbolic offering to the Divine) the “higher” (spiritual) state of the offering is changed. I also believe that we too have a “higher” spiritual counterpart – we too are spiritually effected by taking part in this process. That is the realm in which the transubstantiation takes place. At the same time, the in-flowing of the Spirit in-and-through our offering continues to flow outward, in-and-through those present (and more fully in those who eat and drink of the spiritual Blood and spiritual Flesh), and then continuing outward into the world at large. We are essentially opening a spiritual door providing a point of entry for the Spirit into this physical world. I find this a quite beautiful image; that by celebrating the Eucharist we are better enabling the entry of Spirit into the world; that each time we celebrate the Eucharist we benefit the entire world, even if only a little bit each time. Why Does God Need Us?! Some might say this is kinda nuts! If God wanted more Spirit to enter into the world, why not simply Breathe more Life into it directly? Why are “weak little us” needed to act a conduits? Well, I really don’t know for sure. I think that is just the way it is. I liken it to the view that angels stand ready and willing to help us. However, we first need ask for their assistance! For whatever reason, this appears to be one of the Divine Laws under which we operate in the physical world. I don’t know why this is so. But it is my apprehension that it is so! The reason this is the way it is, may be because we need to first indicate our desire to participate. We have free will. Therefore, we are required to utilize our Directed Intention; to engage our Will, intentionally, mindfully. I believe it is our willing participation in the Divine Mystery that God “needs” from us. Or it may be that by doing so we learn and grow spiritually. We must become active agents to benefit most fully from God’s grace. Perhaps we simply learn best by doing. So the next time you participate in the Eucharist, I suggest you consider this as both an opportunity to breathe-in the in-dwelling Divine Spirit, renewing your spirit, as well as an opportunity to add your own little extra “oomph!” to help make this a more beautiful, loving, peaceful world. 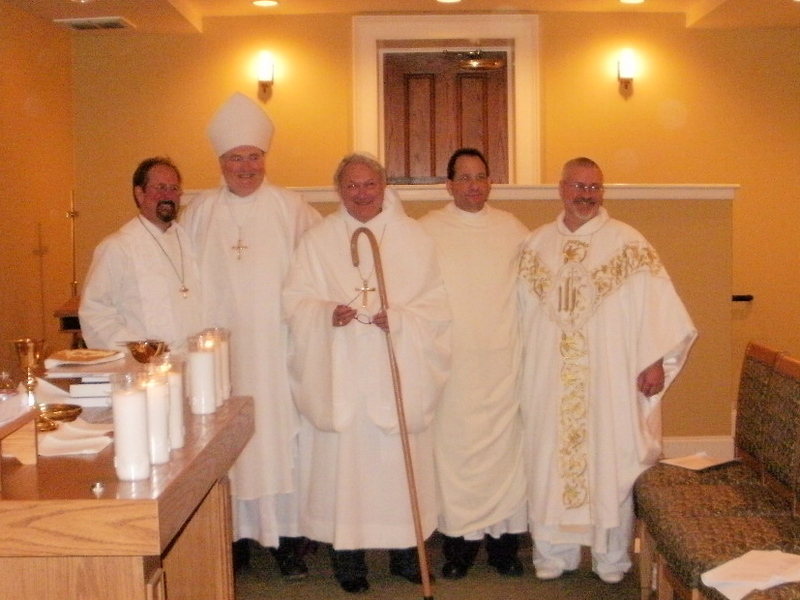 I have been asked a series of questions regarding my recent ordination as an Old Catholic priest, the church with which I am affiliated, their foundational beliefs, and how the Old Catholic Church (OCC) differs from the Roman Catholic Church (RCC). I thought these topics would make good fodder for this blog. My reply is rather long and will be spread across a number of blog posts. I also expect some readers will find certain blogs boring. I suggest just skipping over those and moving along to tastier topics more appealing to your spiritual palette! My reply begins below. It should be noted the following is my personal opinion and may not represent the official opinion of the church and seminaries I have attended. For any errors and omissions I claim fault to be my own. The name of the church I have joined is “Ekklesia Epignostika” which is Greek. “Ekklesia” means an assembly or meeting of people. In the New Testament it is frequently translated as church. “Epignostika” is best understood by breaking it down into two parts, Epi and Gnostika. “Epi” taken most literally means “upon,” “on,” “over,” “near,” “at,” “before,” “after.” But in this case it is meant to convey an idea closer to epic, as in something like large or more specifically transcendent. The root of “Gnostika” is “Gnostic” which means understanding. And not just intellectual comprehension, but more importantly spiritual apprehension. It is in this sense the word is prefixed with “epi.” So the translation would be something like the Church of Spiritual Apprehension. The church’s bishops translate the name of the church as the Church of (Divine) Realization. Other than philosophical differences, USDOE status also requires much larger campus facilities than small colleges and seminaries require, especially for those which primarily offer distance education. Why should such a college require a cafeteria or dorm rooms? We see here clearly a reflection of the past, when all colleges were brick and mortar complexes. But this is changing, and eventually regulations will catch up to the present social changes. In any event, in and of itself, not desiring USDOE accreditation is not uncommon in the religious community. However, I would also say such groups also tend to be comprised of smaller, more fractional groups. The following is a brief summary of my educational path. I first attended the University of Toledo, Toledo, Ohio for 3-1/2 years, accumulating 128-credit hours and no concentration in any subject. I have no degree from UT. Years later I began a series of studies to complete a concentration in religious studies. I began taking on-line classes, and over a period of several years I obtained a religious Bachelors of Arts degree in Religious Studies, through the aforementioned ETS seminary. I am continuing my religious education through the Ekklesia Epignostika Seminary program, from which I will eventually obtain my graduate degree. I am not yet half way through this seminary program. I expect it will take another year or two to complete. Then I will have to write and orally defend my master’s thesis, which will take longer, in order to complete the Masters degree program. So that’s 3-1/2 years of “real” college education and something on the order of 5 or 6 years of on-line seminary classes, taken part-time. I ain’t no Jesuit, but I ain’t no self-proclaimed prophet of agnostika either, heheh. The Ekklesia Epignostika Seminary (EES) course work includes one of the most widely used college textbooks on the New Testament, written by Prof. Erhman. We also avail ourselves of open college lectures from highly respected professors (Harvard, Yale, etc), as well as a variety of other religious lectures either available on-line or through the Great Courses lecture series. I’ve taken well over a dozen lectures on topics ranging from Hebrew Bible studies, to comparative religion and religious studies, to classical Greek philosophy, to religious philosophy of the West, and courses on the New Testament, and New Testament writers and the writings of the Church Fathers. I recall when I was comparing the courses offered by various seminaries I felt the EES compared quite favourably. Almost all seminaries have a base of common work with which one should become familiar, which do not vary greatly from one seminary to the next. Thereafter, one selects an area of more close study. One may choose to specialize in the letters of Paul or in Christian counselling for example. In the case of my seminary (EES), to a large degree that area of closer study is self-selected as a result of wishing to follow their program in the first place. A significant part of the last half specializes in the more “esoteric” studies and those exploring the subject of “divine mystery.” This does not hold an appeal for everyone, but for those such as myself, it is difficult to find a curriculum which places much emphasis on this. Which is understandable as it is a very difficult subject, and notoriously tricky to pin down. The subject of mysticism in itself serves as an example. Many people think that means psychics, table tipping, or talking to the dead. But this is a shallow and misleading understanding of religious mysticism. It is really about the search for God and a desire to experience the Presence of the Divine. But how does one actually convey such an experience to another? Therein lies the tricky bit! By definition we cannot readily relate to the mystical experience, because its domain resides within our unconscious. Yet, there have been a number of studies in recent decades which are beginning to sketch out aspects of this spiritual journey. Or at least those aspects which leave indicators in our physiology. I find this fascinating. So what is a “typical” education for priests? This varies quite a bit. This is obvious once one thinks about it. Just think of the huge variety of churches in the world. They each have vastly different understandings and exist in varying social conditions, and enjoy a rich variety in their histories. Some require their clergy to be ordained into a line of apostolic succession while others allow one to simply declare one is a pastor (and if such a person actually helps others, who is to say the Spirit is not present?). All of this effects the internal traditions of this multitude of churches, which is in turn reflected in their educational needs as well. Among the more rigorous theological models are those observed by the Methodist and Jesuit seminaries. (Although early in their formation the Methodists were criticized for exactly the opposite.) The Roman Catholic Church (RCC) in general is among the more lengthy and extensive educational models, especially in the education of Jesuits. In each of the above traditions the educational course may be expected to last at least five or six years. In the United States, priests must have a four-year university degree in Catholic philosophy plus an additional four to five years of graduate-level seminary formation in theology with a focus on Biblical research. A Master of Divinity is the most common degree. If we now extend this to consider religious educational paths other than RCC we will find a wider academic range. But rather than attempt to detail this, I would rather turn the discussion toward the history of the church and whether apostolic succession is required… among other bones of contention! This is where we will begin to appreciate some of the key differences among expressions of faith. This will require a brief look into the historic evolution of the Christian church to more deeply appreciate the underlying differences that separate the various denominations. And keep in mind, this is only taking a quick look at a slice of *Christian* beliefs and practices! Once one includes other faiths the variety of religious expression and understanding becomes quite complex and very rich. Religion, faith, and spirituality is certainly a fascinating area of study! Please, stay tuned to my blog to hear more of these interesting topics (well, interesting to me at any rate, heheh) as my answer continues! I consider myself a mystic in the sense that I seek union with the Divine. I suspect that one way we may obtain access to the spiritual realm is through our unconscious, which in turn offers access to the Collective Unconscious. Some of my posts here will be a discussion of matters I am considering as I undergo my journey, seeking the Divine Center. No doubt some of the discussion here will be an effort to illuminate my beliefs and compare and contrast them with those held by others. I hope it remains clear throughout all that may transpire here, that I am a religious pluralist. Short of condoning violence, I strongly believe that we must tolerate the religions and spiritual practices and observances of others. What is right for me may not be right for you. And vice versa. And what is right for me today, may not have have been right for me 10 years ago, or possibly 10 years hence. Spiritual maturity involves growth and this must effect our understanding and apprehension of Truth. If we are ever to have peace, tolerance must come first. Then we open ourselves to the potential to discover acceptance for others, and perhaps in some distant day, even appreciation. I have found this to be true for me. And I believe it is a productive means of building community across religious and spiritual differences. How important are such considerations? I don’t know – how peaceful has your evening news been these past weeks? As I write this, not so much I am sorry to say. So there you have it. About as short, while retaining some value, as I can imagine a short introduction to be. Should you, my friendly reader, have anything on your mind or wish to ask a question about what I may post here, please do ask. Nothing ventured, nothing gained, they say.